A friend of mine sent this to me via email. Way too good not to share. 3. Let’s get this straight: it’s called a ‘gravel road.’ I drive a pickup truck ’cause I want to. No matter how slow you drive, you’re gonna get dust on your Lexus. Drive it or get out of the way. 4. They are cattle. That’s why they smell like cattle. They smell like money to us. Get over it. Don’t like it? I-10, I-40, I-70 and I-80 go east and west, I-17, I-15, I-25 and I-35 goes north and south. Pick one and go. 7. If that cell phone rings while a bunch of geese/pheasants/ducks/doves are comin’ in during the hunts, we WILL shoot it outa your hand. You better hope you don’t have it up to your ear at the time. 12. When we fill out a table, there are three main dishes: meats, vegetables, and breads. We use three spices: salt, pepper, and ketchup ! Oh, yeah . . We don’t care what you folks in Cincinnati call that stuff you eat IT AIN’T REAL CHILI!! 14 College and High School Football is as important here as the Giants, the Yankees, the Mets, the Lakers and the Knicks, and a dang site more fun to watch. 16. Turn down that blasted car stereo! That thumpity-thump crap ain’t music,anyway. We don’t want to hear it anymore than we want to see your boxers! Refer back to #1! 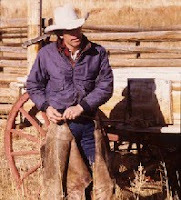 This entry was posted in Check It Out, cowboy quotes. Bookmark the permalink.